Create your own spicy adventure! Enjoy the distinctive taste of Southern Louisiana in all-natural Allegro Hot & Spicy Marinade. Great in red beans and rice, gumbo and blackened dishes. 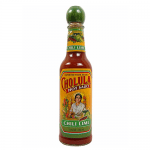 An excellent marinade for grilling and broiling seafood, freshwater fish, chicken, beef and pork. 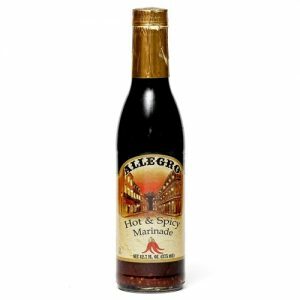 Allegro Hot & Spicy Marinade adds spice to any dish and makes all cuts of meat more tender and flavorful. Contains: Soy Sauce (Water, Salt, Hydrolyzed Soy Protein, Corn Syrup, Caramel Coloring), Water, Spice, Lime Juice (From Concentrate), Dried Onion, Dried Garlic, Citric Acid. Gluten Free. Contains: Soy Sauce (Water, Salt, Hydrolyzed Soy Protein, Corn Syrup, Caramel Coloring), Water, Spice, Lime Juice (From Concentrate), Dried Onion, Dried Garlic, Citric Acid. Gluten Free.